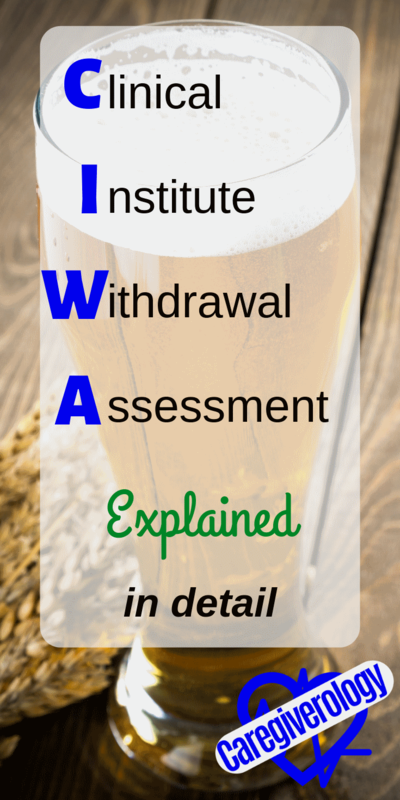 CIWA-Ar is an acronym that stands for clinical institute withdrawal assessment (revised version) for alcohol. 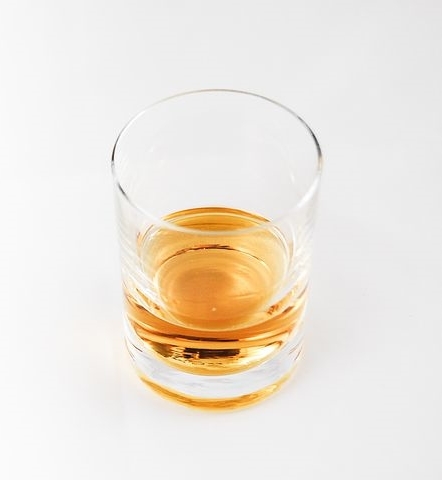 It is a tool used to measure withdrawal symptoms for patients who are typically dependent on alcohol. The assessment is often done every four hours while the patient is stable, but more often if the patient starts to show withdrawal symptoms. To use this tool, simply use the 10 question scale below. 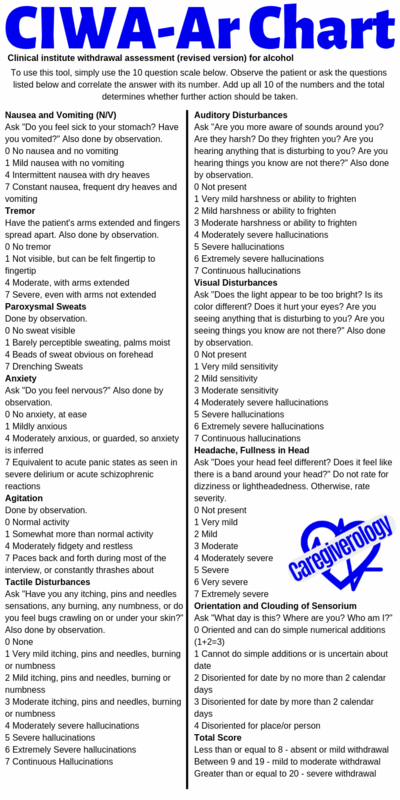 Observe the patient or ask the questions listed below and correlate the answer with its number. Add up all 10 of the numbers and the total determines whether further action should be taken. Use the calculator below as needed. Ask "Do you feel sick to your stomach? Have you vomited?" Also done by observation. Have the patient's arms extended and fingers spread apart. Also done by observation. Ask "Do you feel nervous?" Also done by observation. Ask "Have you any itching, pins and needles sensations, any burning, any numbness, or do you feel bugs crawling on or under your skin?" Also done by observation. Ask "Are you more aware of sounds around you? Are they harsh? Do they frighten you? Are you hearing anything that is disturbing to you? Are you hearing things you know are not there?" Also done by observation. Ask "Does the light appear to be too bright? Is its color different? Does it hurt your eyes? Are you seeing anything that is disturbing to you? Are you seeing things you know are not there?" Also done by observation. Ask "Does your head feel different? Does it feel like there is a band around your head?" Do not rate for dizziness or lightheadedness. Otherwise, rate severity. Ask "What day is this? Where are you? Who am I?" The action taken after the CIWA-Ar score is calculated depends on the order. Typically the order is to give a medication that helps relax the patient. The hospital where I am employed typically gives lorazepam (Ativan) if the patient has a score of 8 or above. Other meds that may be given include diazepam (Valium) and chlordiazepoxide (Librium). The IV dose is typically preferred because it works quicker than the oral dose. Also, It can be given when the patient isn't able to take pills due to the severity of the symptoms or if they have a nothing by mouth (NPO) order. After a dose is given, the patient is then reevaluated after 15 minutes to determine whether another dose is needed. Sullivan JT, Sykora K, Schneiderman J, Naranjo CA, Sellers EM. Assessment of alcohol withdrawal: the revised clinical institute withdrawal assessment for alcohol scale (CIWA-Ar). Br J Addict. 1989 Nov;84(11):1353-7. PubMed PMID: 2597811.